Orange Kenya has launched a Facebook dial service, that offers mobile access to Facebook to entry level customers who were not previously mobile data users. 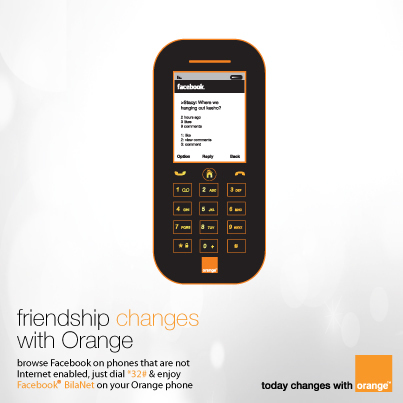 The service ,dubbed ‘Facebook Bila Net’, targets Orange customers who have basic non-data enabled phones. Orange customers can subscribe to Facebook Bila Net by dialling *32# and choosing their preferred bundle: daily for KSh 10, weekly KSh 50 and monthly for KSh 100. According to Orange Facebook Bila Net is cost effective offering compared to KSh 1 per minute that an entry level handset user would pay to access Facebook at an Internet cafe.